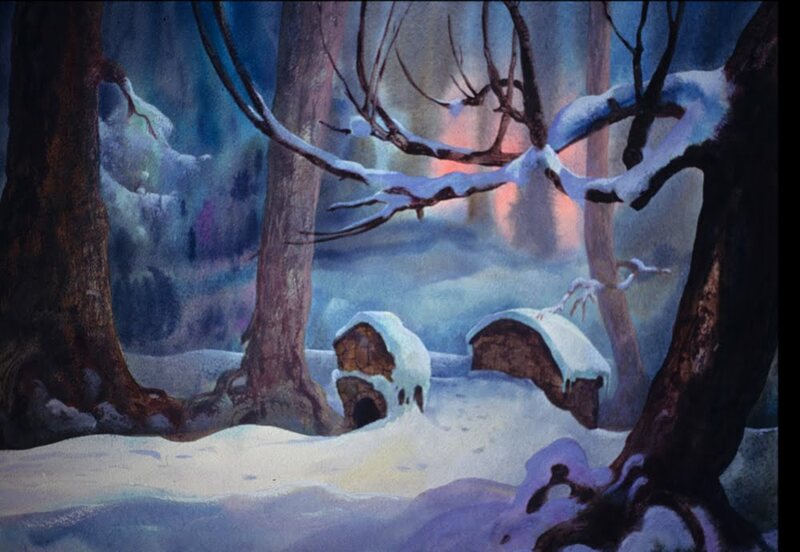 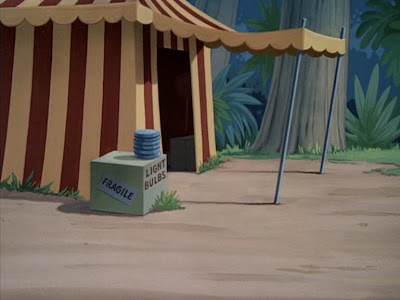 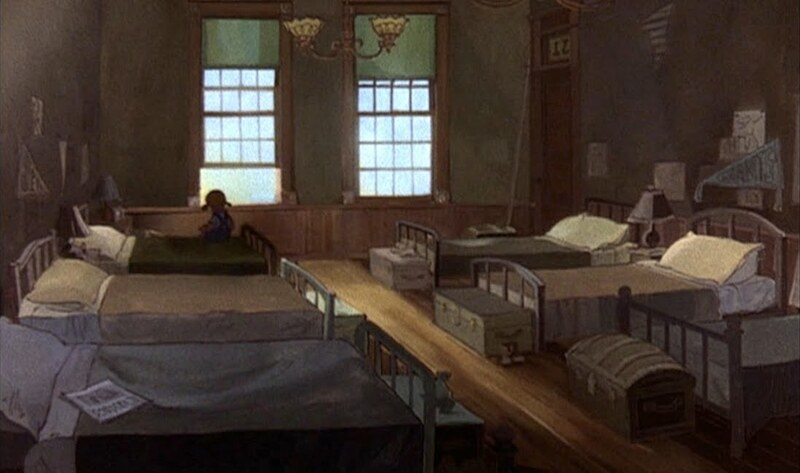 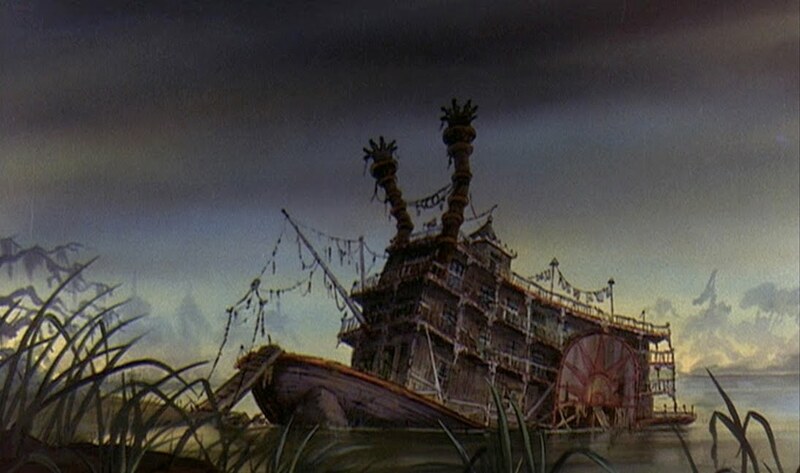 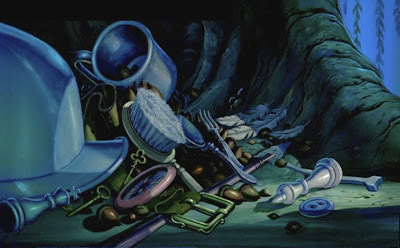 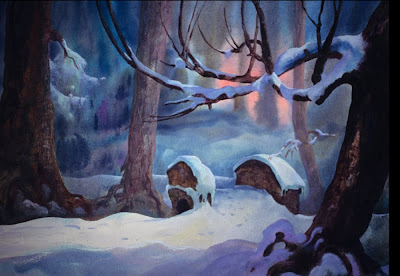 Today we're once again taking a look at art from THE RESCUERS. 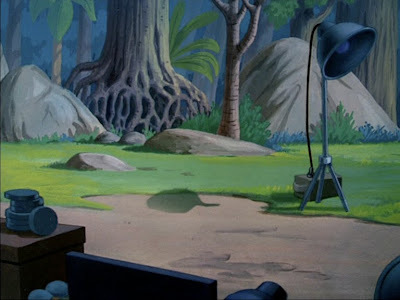 Scroll down to see two additional posts of digitally restored backgrounds. 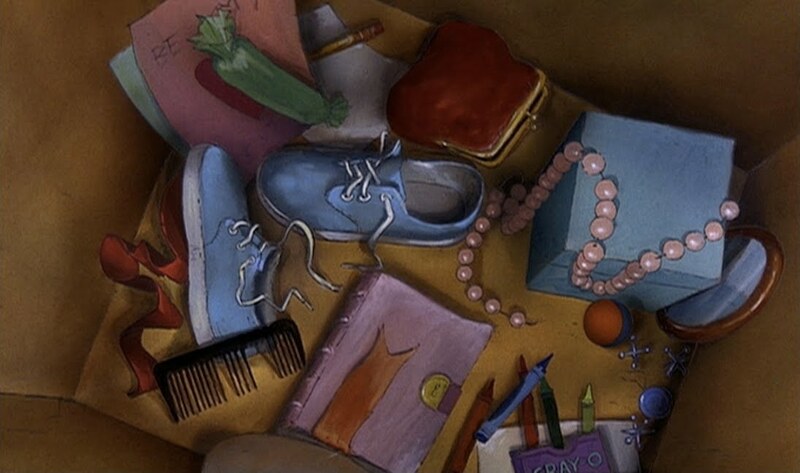 THE RESCUERS level of artistry was very good indeed. 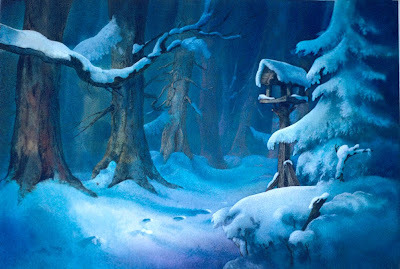 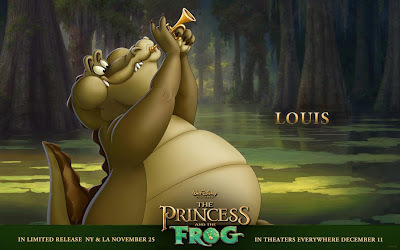 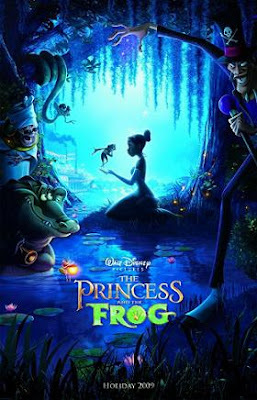 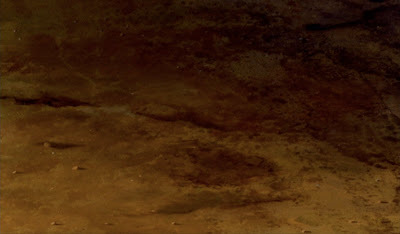 While it certainly wasn't SNOW WHITE or FANTASIA, it was and is a beautifully crafted film. 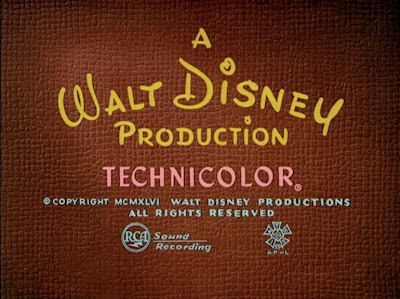 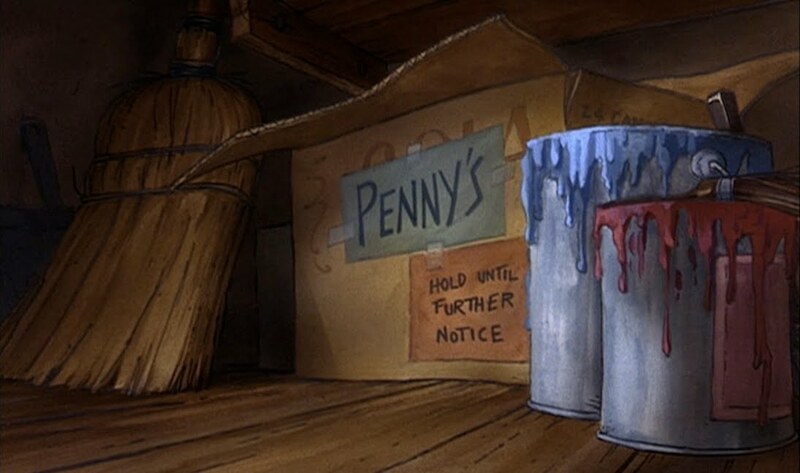 Cost-cutting at the studio was always a concern, but especially after Walt's death. The eyes of THE RESCUERS mice had no whites, just a gray background. 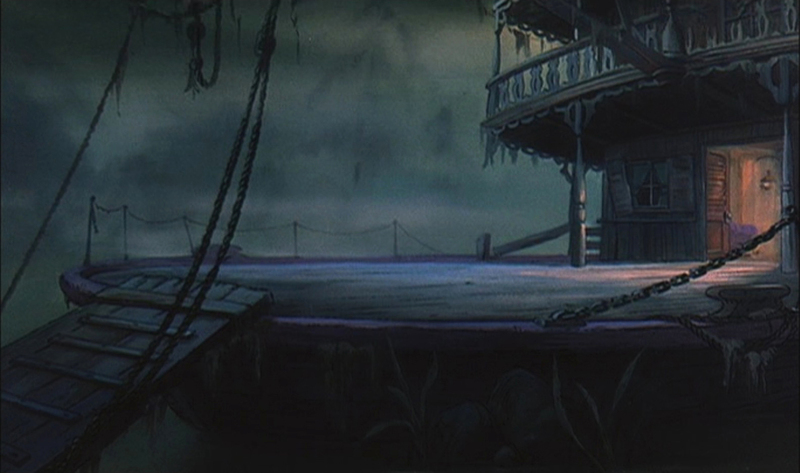 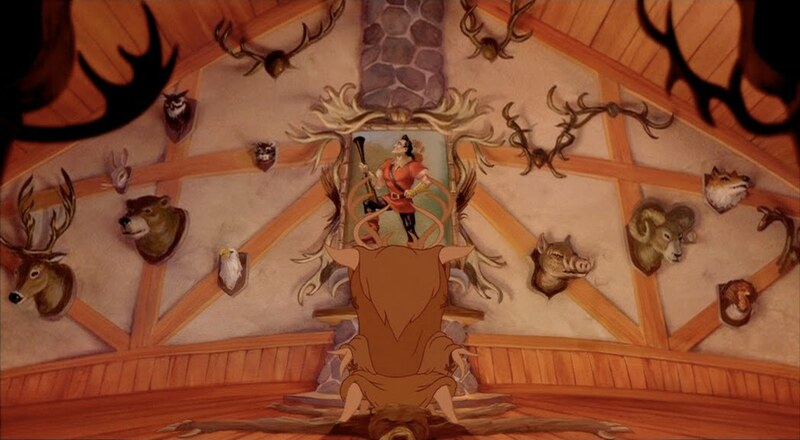 Legend has it Don Bluth was so incensed at this it was a key reason for his departure from Disney, which eventually led him to open his own animation studio. 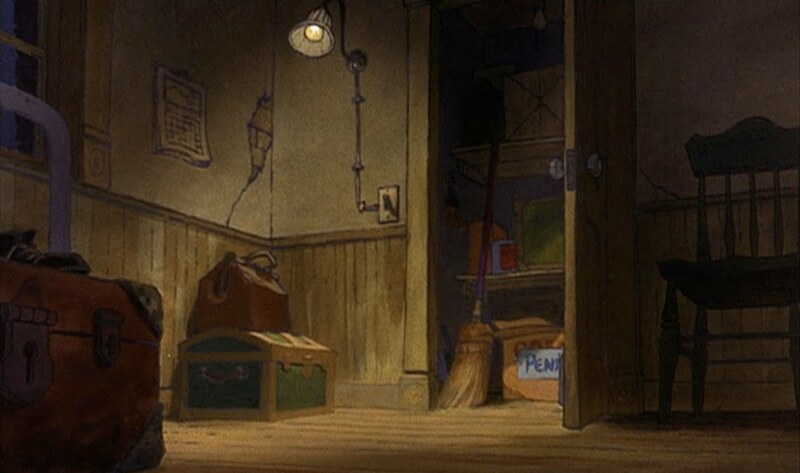 The movie's poignancy was no doubt a reflection of many of the artists' feelings at the studio, as the older animators prepared to retire and passed the baton on to the younger animators. 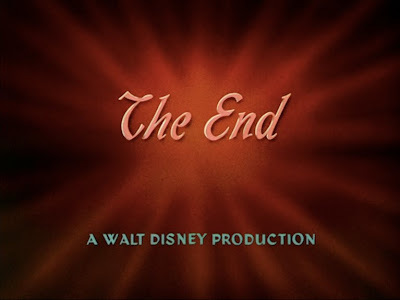 It's a lovely, unpretentious and unashamedly sentimental film... perhaps that's why it is so endearing. 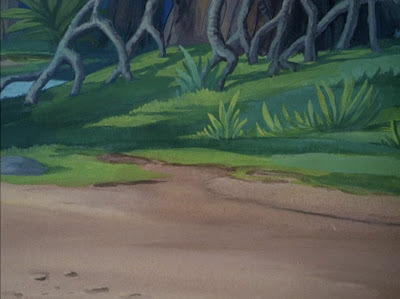 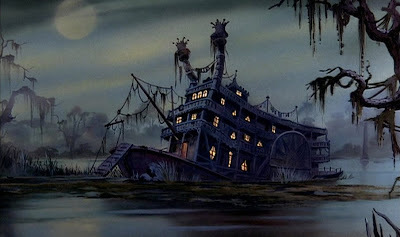 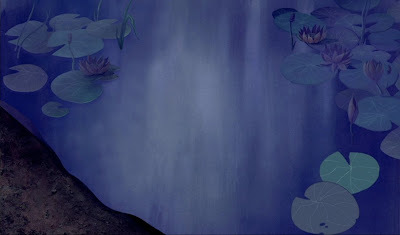 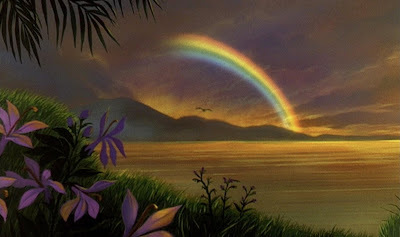 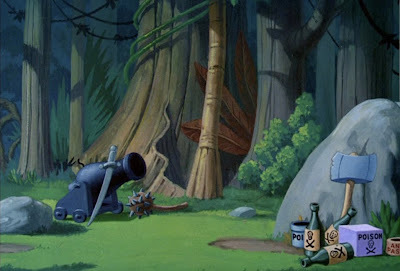 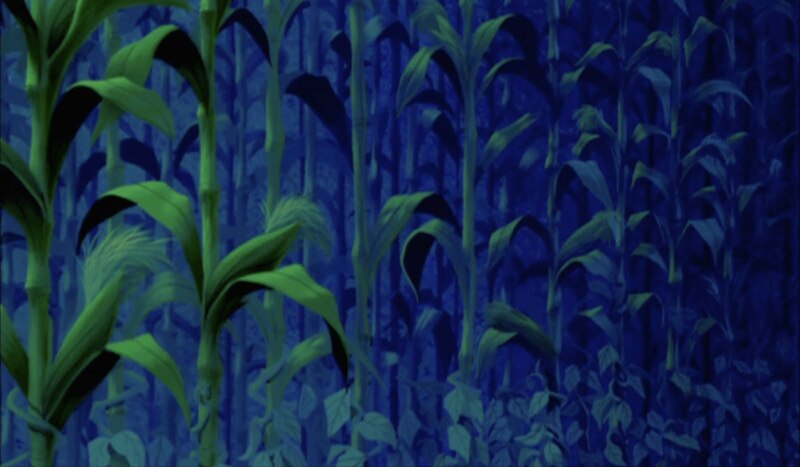 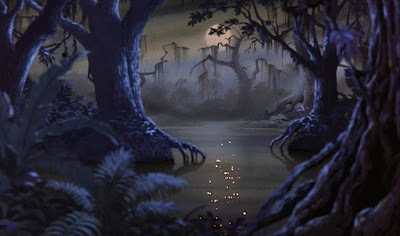 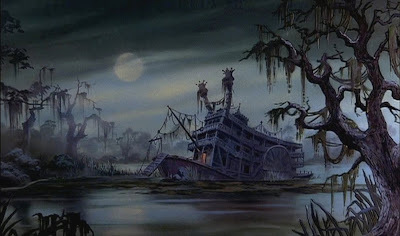 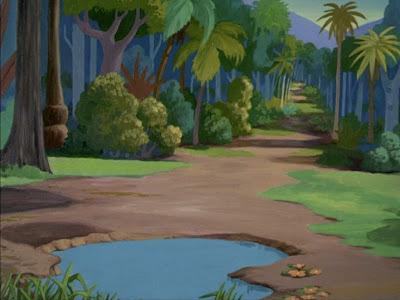 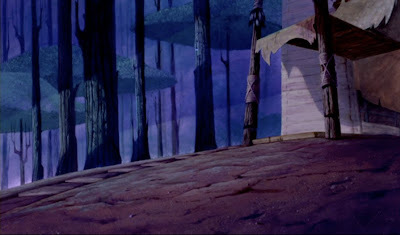 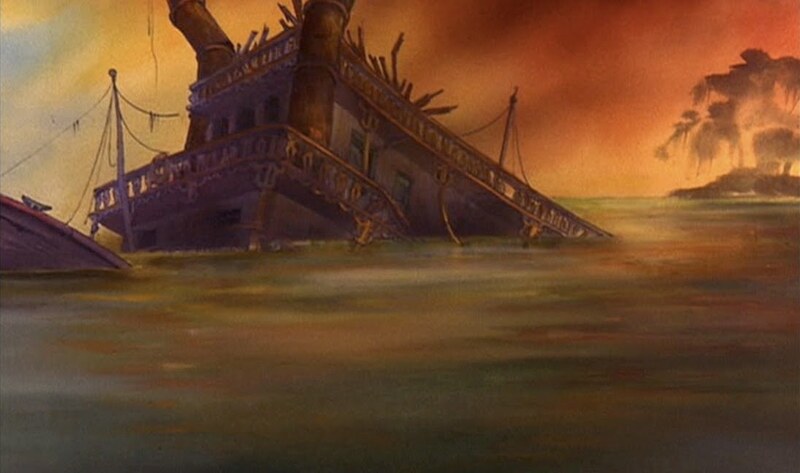 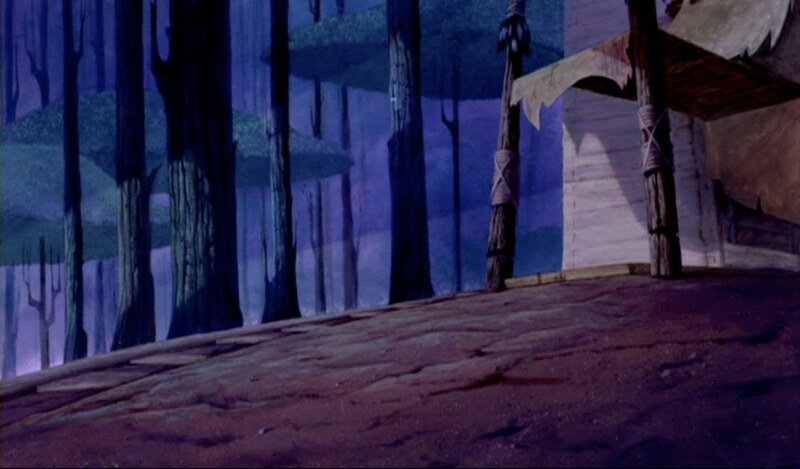 Here are two additional POCAHONTAS backgrounds. Each is extraordinary in its own way. The first is the deepest level background from a multi-layer pan "in." 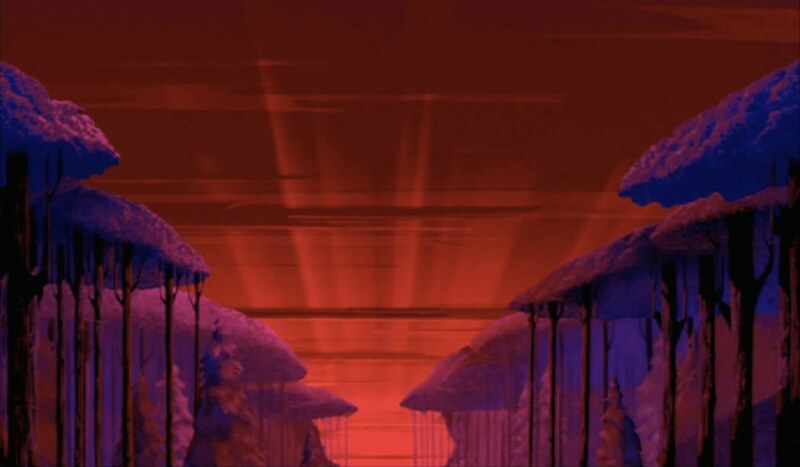 I tried to recreate the entire pan but too many layers moved. At least I was able to eliminate all digital "cel" overlays. It's a gorgeous sunset. 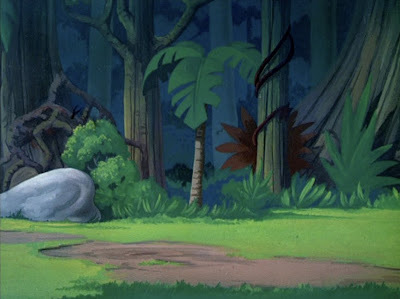 I find both of these to seem vaguely reminiscent of artwork from "FANTASIA." What do you think? 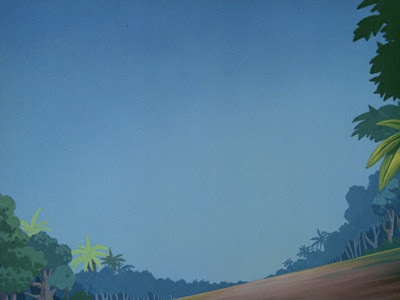 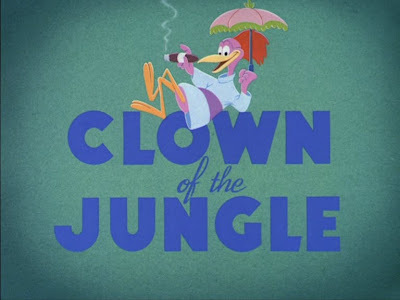 Recently I posted a batch of B/G art from the 1946 Disney short CLOWN OF THE JUNGLE. 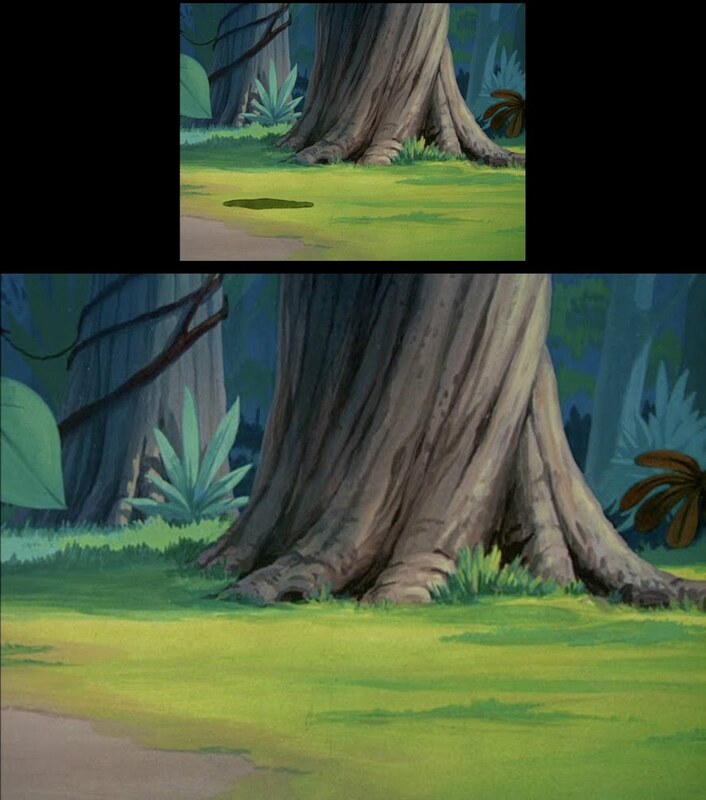 There was a particular background in which I was able to remove the characters, but one shadow never went away. 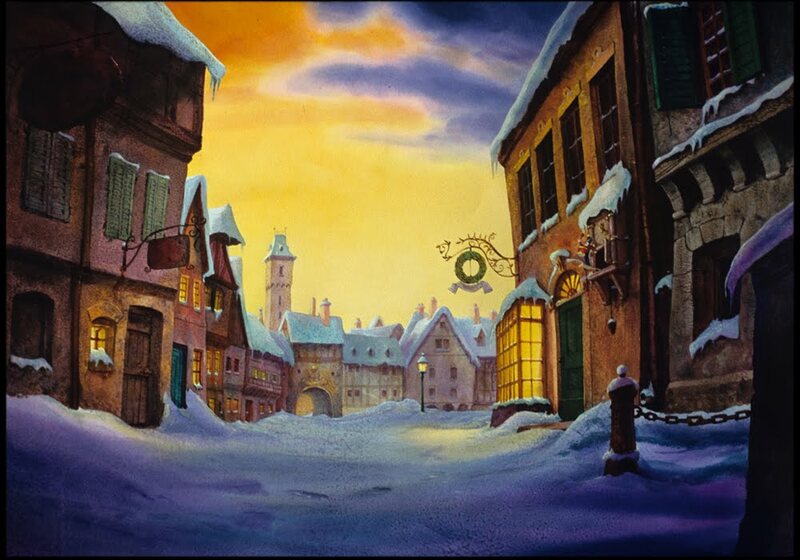 I was delighted to receive by email that same background, with hand-painted retouching (I assume via Photoshop), shared by artist Peter Moehrle! 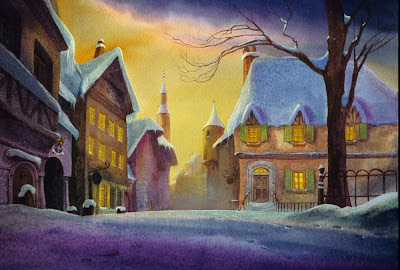 He is a truly master at animation background art, with a dazzling style and a resume to match. Among his credits, he trained all the background artists on Disney Studio's LILO AND STITCH in the fine art of watercolor backgrounds. 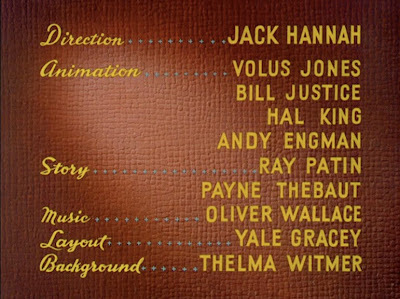 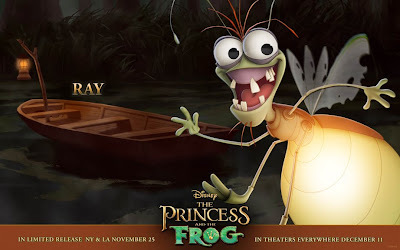 He also worked on MULAN. 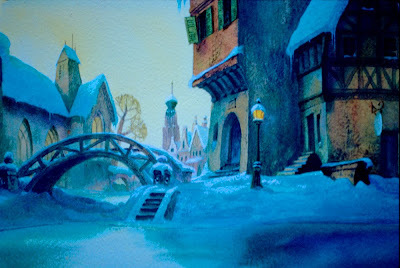 He is the real deal, a genuine animation background artist, with Disney studio credits (and others). Here is a small version of what I was able to achieve, my "semi-original," coupled with Peter's beautifully retouched version. 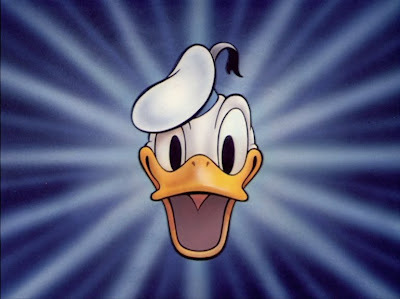 a cartoon starring Donald Duck! 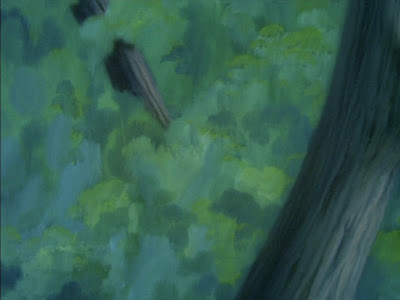 I couldn't figure out how to do the first, opening pan B/G because of the moving multiplane layers in the foreground. 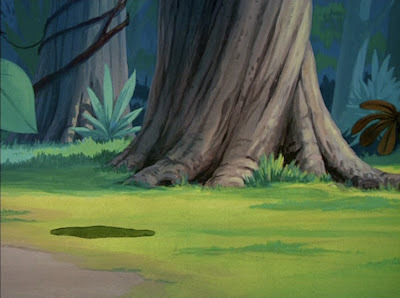 I was able to digitally remove Donald and the Aracuan bird, but that shadow refused to budge!